The U.S. stock market has continued its rise through 2014 sitting just shy of DOW 17,000 after a brief decline. With stocks resting at outrageous valuations who are the relentless buyers that are pushing prices higher? At this moment there are two. 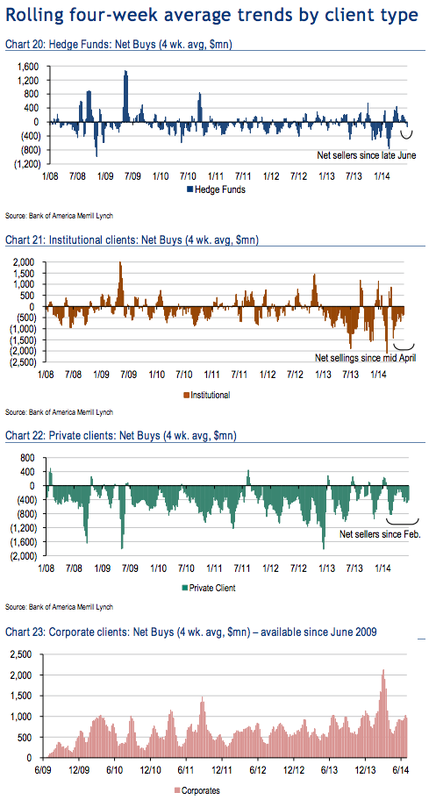 The first three graphs in the chart below show that hedge funds, institutional clients and private clients are currently U.S. stock sellers. The buyer can be found in the fourth chart; the corporations themselves. This same process occurred during the last market peak with corporations rushing into the market to purchase stocks when they knew they could never fall. When stocks became far cheaper in early 2009 companies were scared to death to purchase their own shares. 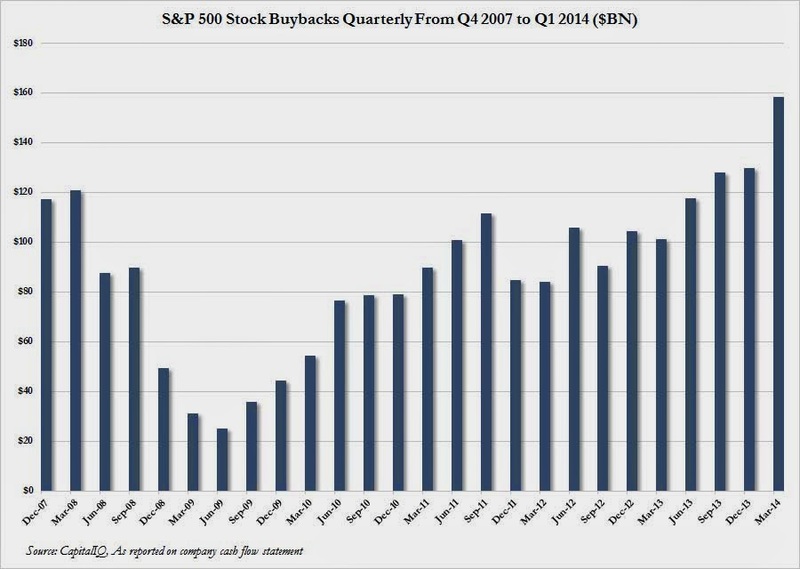 The cycle has come full circle again as stock buybacks have exploded over the past two years; approaching an incredible $2 trillion in the S&P 500. This time around corporations have an added incentive beyond the typical euphoria that accompanies buybacks at the peak. The cost for corporations to borrow money (by selling corporate bonds) is currently at the lowest level in history. The ability to borrow at ultra low interest rates makes it more attractive to borrow money to purchase their own stock than to use cash elsewhere. This is due to tax advantages and the reduction of dividend payments. For a detailed walk through with actual corporate examples I recommend reading this great article from Gordon Long. I guess you cannot blame corporations because everyone's model is now based on these two assumptions. During this buyback spree the executives of the major companies (insiders) have been selling their shares with force while they continue to recommend the companies leverage up to buy more shares. Who is big buyer number two? A report released last month from the Official Monetary and Financial Institutions Forum (OMFIF) titled Global Public Investors showed central banks have now become major buyers in stock markets around the world. With central banks now diversifying their holdings into stocks does it put a "permanent" floor under prices? This was an argument for an endless rise in gold during 2011 as central banks had begun to move heavily into the gold market during 2010 and 2011. At the end of 2011 the endless rise in gold theory was crushed as it experienced the largest cyclical decline of its secular bull market. All of this does not mean that stock prices need to top this afternoon and turn down tomorrow. With the corporate debt bubble in full swing, corporations have the ability to continue to borrow money at ultra low rates and arbitrage profits through their stock buyback programs for a long time. Central banks have the ability to continue to print money and purchase stocks or diversify more of their holdings into the stock market. 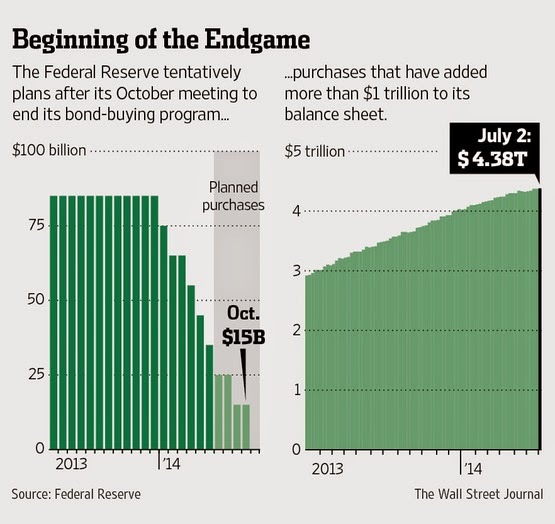 One problem with this theory, for those looking to the Fed to be the unlimited buyer, is the Fed is currently winding down its QE program which is scheduled to end in October. Stock values in the United States are incredibly overvalued by historical standards. If you are betting on a permanent rise in prices based on the two factors above, just understand that you are playing with fire.